Today Alice spoke about her escape plan. After today I need one too. How can this be my life??? I asked the doctor if I should be concerned that my son has broken two bones this year. Is there a reason that he is breaking bones more frequently than he cleans his room? Could there be something wrong? He’ll be available on ebay later today if you want him. Just make sure you have good health cover! That looks painful! A broken ankle? No fun in that, right on Xmas. Sending cyber chicken soup to your son, & you had better have some too! Pack him off to France ! It’s his foot, not his ankle. A girl who came up to his shoulder. Nope I don’t want to buy him on ebay. I need someone who can work, not lay around all day whimpering in pain. 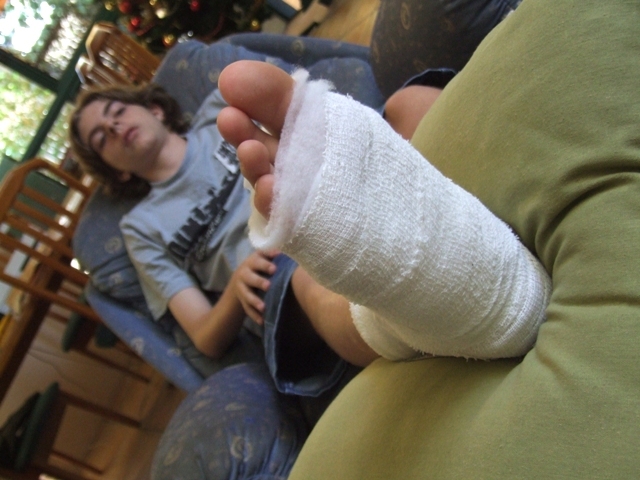 With the size of his feet they’ll need to start knitting more bandages. Christmas is a good time to break things – you get to sit still, watch films, eat chocolate and there are lots of people around to look after you. However, you need to heal quickly because January is a boring time to have a broken foot. Milkshakes are good for bones…so make sure that Mum is drinking plenty because she needs her strength to look after you. Maybe 13 is his unlucky health crises year? Ugh. Bet he’s a brilliant patient though. No complaining or anything. Plan B won’t be very helpful if he has a broken ankle. He better mend quickly if he is expected to do cooking duty. Luckily, no snow/ice where you are ~ my biggest concern in winter is a foot injury and having to get around in snow and ice. Wonder if he’s trying for extra sympathy gifts for Christmas? I am sending my hugs for a speedy recovery. I have my own boys who keep me jumping so I will have to past on the buy offer. OW! Nah, 13 year old boys in general seem to do stuff like that. I don’t think they understand “mortality” until about age 40. Sometimes not even then. That’ll teach him not to kick girls. Poor baby. I’m sure Plan B can cook with a broken foot…he doesn’t need that to stir. N(aged 2.5 years) advises Plan B that he “needs to be more careful next time”. Poor Plan B: he’s even getting caution advice from a 2 year old! She better not get too close though – he might kick her!